Eight bits should be enough for anyone..
On the software side, I’ve rewritten the game loader ROM – it now allows snapshots to be saved to the SD Card, Pokes to be entered (in all games not just those loaded from .taps as was the case before) and is generally neater looking. 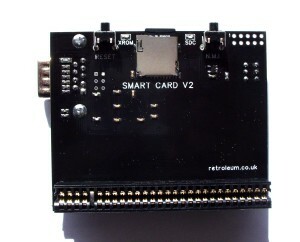 The new software should work fine on the V1 SMART Card too, so if you have one of those you can update it by installing the latest ROM from the project archive downloadable here. Update: 26/9/2017: I’ve also made a toolkit ROM which allows SD Cards to be formatted to FAT16 actually in the SMART Card (even those larger than 4GB).